Background: Chin augmentation has been done by a variety of materials over the years. Each biomaterial used has is own unique handling and tissue response characteristics. But fundamentally these materials come down to those with a smooth or non-smooth outer surface. Materials with a non-smooth surface are associated with varying degrees of tissue adherence and/or ingrowth. One such chin implant material is that of mersilene mesh. Technically mersilene mesh is not a true chin augmentation material. There are no performed mesilene mesh chin implants, manufacturer’s who make and sell them nor is it an FDA-approved facial implant material. 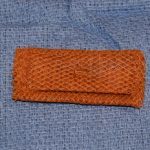 It is actually a mesh material that comes in sheet that is an FDA-approved implant for hernia repairs. Surgeons use it of-label for chin augmentation by rolling it into a multi-layered form that is sutured together. 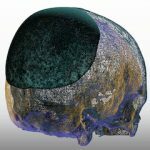 The advantages of a mersilene chin implant is that its porous material allows for tissue ingrowth and adherence. Its cloth-like material surface avoids displacement once positioned because of a high frictional resistance. These material characteristics, however, do not make it resistant to the risk of long-term complications. Case Study: This elderly female had a history of a facelift with a mersilene chin implant 25 years previously. Six months before she came to see me she had developed an intraoral drainage site just above the vestibule between the canine and first premolar. 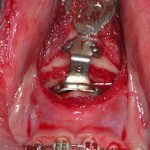 To treat this intraoral problem she had been through extensive dental treatments including root canal, apicoetomies and teeth extraction…all without success. Pressing on the anterior vestibule behind the lower lip created a purulent discharge from the fistulous opening posteriorly. Under IV sedation her old submental incision was opened and dissected down to the implant. It had significant tissue adherence but eventually was able to be removed in its entirety. A submental tuck was then done to avoid any postoperative chin ptosis. While not expected and completely misdiagnosed, the mesh chin implant eventually caused a tissue erosion that developed an exposure into the overlying intraoral vestibule. 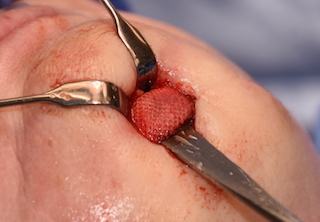 One may believe that tissue ingrowth prevents an erosive potential of an implant, or avoids an infection with material exposure, but this case illustrates that is not an accurate biologic expectation. 1) It is possible that chin implants can cause a long-term soft tissue problem through erosion. 2) A chin implant can cause intraoral symptoms that can be confused with a dental problem. 3) Mersilene facial implants can be successfully removed but they do not do so easily due to the tissue ingrowth.